Pet Project - On Sale Now! These are available now for sale! 4"x5", b/w, 36 pp, gocco cover, crazy japanese stab binding $5.00 (USD) + postage. News time at Doodle Bug Central! 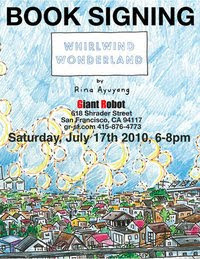 GIANT ROBOT SF, one of my favorite stores of one of my favorite magazines has been nice enough to host a booksigning for Whirlwind Wonderland. If you are in the area, stop by the Haight!